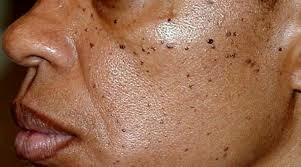 Black spots(Seborrhoic Keratosis) due to ageing are seen on the face and different parts of the body. Skin tags are large skin hanging type lesions on the neck . These can be removed using Co2 laser in one sitting.